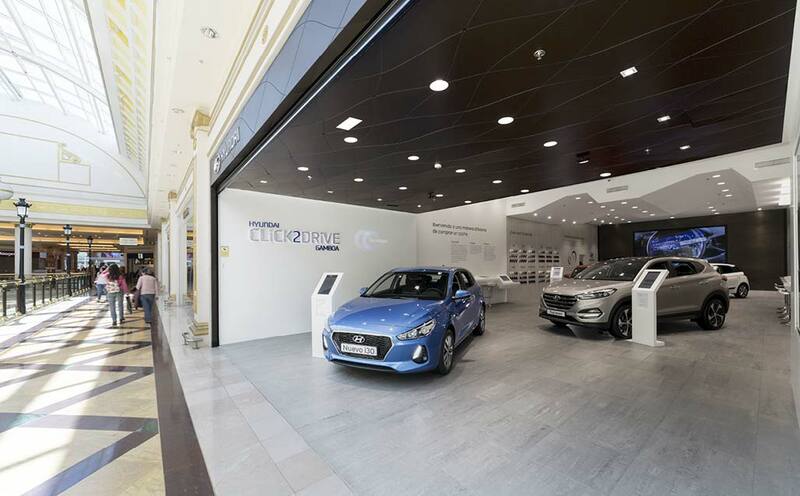 Pioneers in Spain, and with just two forerunners in the United Kingdom, HYUNDAI presents the new space in which it reinvents the experience of discovering a HYUNDAI, Click2Drive. The new space is found at the Gran Plaza 2 Shopping Centre in Majadahonda, Madrid, combining reality and virtual reality in a place for looking, touching even trying a vehicle that we can find in the car park of the shopping centre in our own way with the help of an advisor. Due to its extensive experience of developing commercial spaces, the Spanish subsidiary of the Korean brand, HYUNDAI, selected for undertaking this project was Spasvital, a group specialised in the complete development of Premium spaces. For this work, Spasvital collaborated with architect Antonio Matamoros. Spasvital’s intention was to create a space that would evoke modernity and innovation, with resistance, durability, easy cleaning, thermocurving and being anti-bacterial without additives being some of the properties of KRION which convinced the company to incorporate our material. We can find KRION as a bar where the computer terminals are located, as a wall covering, including the wall that bears a TV screen, and a wall with images projected onto the KRION itself. The mobile stands, with the technical specifications and information on the vehicles are also made with KRION, giving the space the sensation of unity and continuity with the rest of the elements. The colour used for this work was KRION 1100 Snow White.